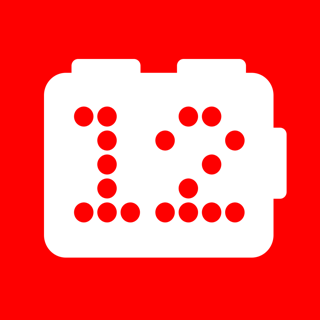 12 Minute Athlete is a high intensity interval training (HIIT) regimen of incredibly effective workouts that you can do in around just 12 minutes a day with minimal equipment & no gym membership. Includes detailed instructions & video demonstrations of the exercises to help you get through each of the workouts. Just pick how long you want your workout to be, choose which equipment you want to use, then work hard! - 185+ full-body HIIT workouts to choose from. Workouts are either 12 minutes, 16 minutes or time challenge. - Short, intense workouts focus on strength, cardio, interval & core training. - Seven possible equipment choices with option to choose bodyweight-only workout as well. - Simple functionality, easy & fun to use. - 35+ bodyweight and equipment-based exercises included. - Access to step-by-step instructions and video demonstrations for every exercise, any time. - Ability to save favorite workouts and interval timers for easy access. - Share your workout on Facebook & Twitter. - Interval timer & stopwatch give options to do your own workouts at any time. 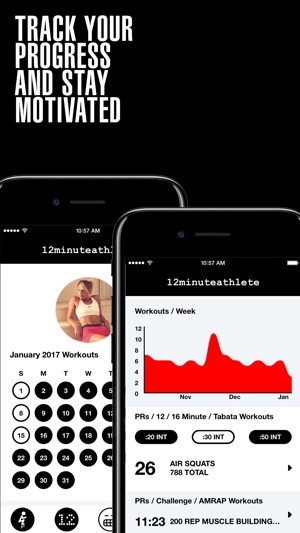 - Get all new workouts 3-4x a week pushed straight to your phone as soon as they're released on 12minuteathlete.com! - Workout Tracking & Data Visualization: Track your workout activity, view your PRs & see lifetime insights with really cool graphs and visual aids. 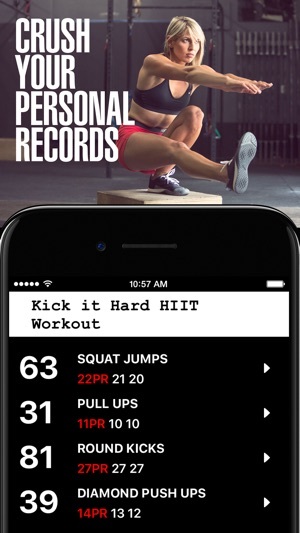 - User Profile & Goal Setting: Easily view your personal data, keep track of PRs, workout frequency & more. - Workout Power Packs: Power Packs include Apartment-friendly workouts, Tabata workouts, Boxing workouts & more! This App is more of a “trap” instead of a freedom individual workout. You pay $2.99 for just an already set 12 minutes or a 16 minutes workout that you cannot edit nor change workouts etc. In order words, if you don’t like that 12 mins or 16 mins workout this app is pretty much useless. I think you should be able to set your own exercises from the ones available and create your own workout. So if you want to have more of a freedom, you have to spend even more money and purchase one of their “workout packs” which will unlock more workouts. But once again, they are all already set workouts so if there’s one in that workout pack you can’t do because you don’t have the equipment needed, you can’t substitute it or change it for another one. Also, you can’t view the exercise packages BEFORE buying a pack so if you don’t end up liking that workout pack, you’re once again screwed. You should be able to see what you’re buying first!!! They also offer types of programs and a monthly and annually programs. At the end of the day, the main idea of this app is to be a business trap rather then a workout app. I would love my money back for the app and packs I bought. Not happy. I'm prior military and have been in sports like baseball, football, and even MMA since I was 4 years old. I'm a father of 5 kids which all have after school activities and I was looking for something that can have a quick workouts but still have the intensity I've been missing. I thought this was more for women but I can assure you, these workouts are tough for guys and yet quick, exactly what I needed. Love it!!! Bait and Switch!!!! Not how you do business! I’m extremely disappointed. I have been using this app for 3 years keep up my fitness goals. One day I open the app and the features that were previously available, now cost $8 per month. I understand if as a company, you want to create a subscription business model, but if a customer is an early adopter, you grandfather them into the original offering. This is doing the right thing. I hope that the team behind this app does an integrity check with their business decisions. Extremely disappointed. Please do the right thing!